Branded in Ink challenges the face of western marketing with images and techniques authentic to the working cowboy and western lifestyle. Branded In Ink Challenging the face of western marketing. This was taken by Leslie Dorrance, I was saying goodbye to a mare I rode. 2. Tell us a bit about how you got a start in braiding, and what drew you to it? 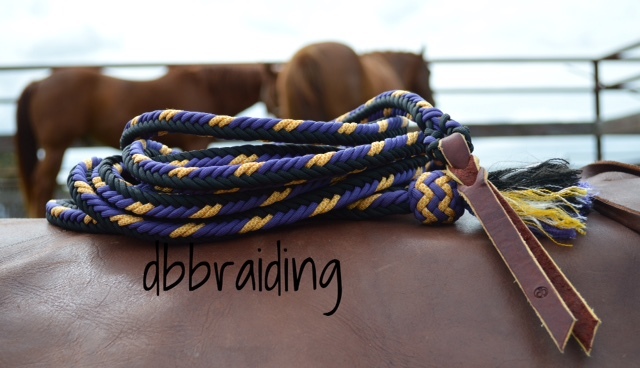 I was initially drawn to braiding because I disliked ruining my leather reins, seriously! When I was a kid I had the privilege of being involved with droving cattle from the mainland to Snake Island, this was a seasonal occurrence and shared among local farmers. These trips were all done horseback riding through the mud flats at low tide and across the inlet channels which was pretty tough on gear. I started to braid my own reins and bridles from synthetic baling twine. It seemed a good idea at the time as leather tack was much loved and expensive. That was my first experience but I never dreamed where it would lead. More than a decade later I travelled to the USA to meet Tom Dorrance. Fate had it that my first encounter with a Dorrance was actually meeting Bill, Toms brother. However I didn’t know anything about him or his braiding. Bill and I got on famously from the get go and for several months I settled on the ranch and fitted in to the families daily ranch life. Bill was a talented roper, he mostly used a reata when we branded, all of which were braided by him. My interest and admiration for Bills gear became the basis for braiding some for myself. Scraping hides, running strings and braiding rawhide was also a big part of this. Bill was a good teacher, and he fostered my interest for roping and braiding. Leslie (Bills daughter in law) was also making some gear at that time. She introduced me to finer leather lace work and parachute cord. From there I was encouraged to make mecate reins for a store in Brighton, Colorado. The owner sent me the rolls of parachute cord and I’d make mecate reins and leads for his store. It really got going from there and I did a lot of trading with other artisans and gear makers at brandings, ranch ropings and gatherings. The horsewomen and men I rode with sought out attractive handmade gear as an investment in themselves and their way of life. I was humbled by and privileged to make custom orders for them back then and to this day. After living and learning about the Californian/Spanish ranch lifestyle I returned to Australia where very few horse people had any knowledge of mecate reins or the Californian traditions. I retrained myself and began making Split reins for our stockmen and women with the parachute cord while continuing to promote and use my own gear I had made throughout my riding pursuits here and abroad. Me and Bill looking over some work. 3. It’s pretty clear you have an interest in photography as well, do you find your art blends into other aspects of your life? Absolutely! I’ve been a keen and dedicated artist in several mediums over the years. Basically I do it for the love of capturing an image, I love to write as well but get busy doing other stuff so I see my art as an illustrated narrative. 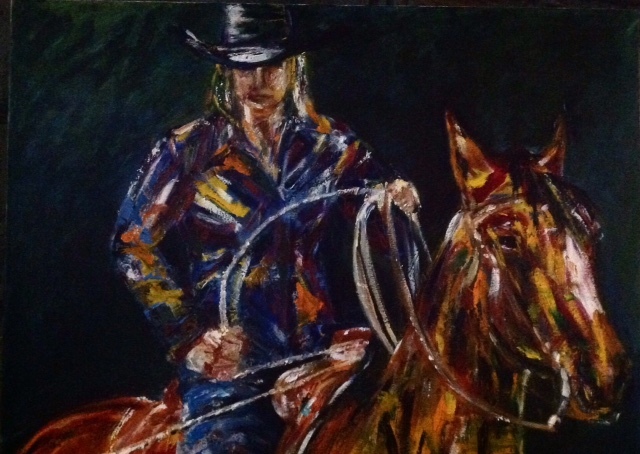 My art portrays my life and love for horses and the land. My travels throughout Australian and abroad have also been a great inspiration. Several of my photographs have been used in magazines and articles over the years. I am humbled and proud to say that one of my etchings was acquired by The Gippsland Art Gallery last year (2017). An oil painting I did a few years back. 4. What are some of your tips to stay motivated, inspired and refreshed on a daily basis, which can be draining when you work online? The only tip that may be worth sharing is …I do what I love to do. I’ve spent many years getting to a place in my life where I feel balanced. Its that simple. None of this has come easy but resilience and inner strength has got me to where I am. Lol! Thats a entirely new chapter or manuscript. 5. What do you wish you were better at in business or life? Everyday I practice at being a better person. Oak tree at the back door reminds me of great potential. Came from this small seed. 6. Name something a person wouldn’t know about what it’s like to be a braider. 7. Who do you turn to, online or on the phone or in real life for advice or inspiration? I have learnt to trust and rely on myself these days. Inspiration comes from being in nature, in silence, using my gear with my horses and helping others with theirs. I listen to podcasts, audio books or have the tunes cranked up whilst working in my studio. The time I spend creating my art could be described as meditation. I will also browse through my journals and photos to remind myself of a style or arrangement I worked with or learnt years ago. Some of my earlier work. There was no market for it back then so it's part of my private collection. 8. You seem to have a passion for land and the environment that not everybody in agriculture vocalises, even if they share the same passion. What has been your journey in environmental focused agriculture? I’ve always had an affinity with the land, nature and animals. I grew up on a farm where my family were into a healthy lifestyle, growing food, rearing stock with care for the land. I take an interest in the likes of Savoury, Andrews and Podolinsky to name a few. Their practices of working with the landscape and nature make sense to me. Further, my experience of living and working in many different locations has taught me to observe how the landscape and animals respond from the hands of men mostly driven by profit and greed. Man spends a lot of time and money messing around with what is already perfect. My opinions are mostly from observation and experience. Me and my QH gelding bred and started here. The cattle we bought as weaners and finished off. 9. You have often described yourself as a “black sheep” - how is this true in your life? Maybe its just that I’ve always done my own thing. Being true to myself has enabled me to embark on some of the most enlightening experiences, grateful encounters and endless adventures. Many people have said “you’re so lucky”, but in all reality …I make my own luck. Best view of Hay season here. 10. Can you share a favourite quote or two? Oh boy I have so many favourites, some my own and others are found treasures. Colours available now are endless. Are you ready to rope? Website by Branded in Ink, photos by Jessica Hedges unless otherwise listed.